Today is Remembrance Sunday in the UK, and Veterans’ Day in the US. It’s also the centenary of Armistice Day. 100 years ago today, on the “eleventh hour of the eleventh day of the eleventh month” of 1918, the armistice was signed between the Allied Forces and Germany at Compiègne in France, formalizing the cessation of hostilities of World War I. On a personal note, I’ll be taking time to think about William Dalby of Shirebrook in Derbyshire, a man I’d never heard of this time last year. As you can see from the copy of his service record card at the top of this post, he enlisted in the Sherwood Foresters Regiment on January 7, 1915, aged 27 years and 220 days, and was first posted as part of the Expeditionary Force on 23 October 2015. William went to war and left behind Annie, his common-law-wife, and six children: Eliza, 13; Minnie, 12; Ruth, 10; Albert, 9; Arthur, 5; and Ada, 2. By my reckoning, he first became a father at the age of 13. His oldest child grew up to become my grandmother. I remember my grandma as plain-speaking, practical, competent, a tough cookie. Maybe even hard, though she was crazy in love with my granddad. She never talked about her family—I never even knew she had siblings—but I believe she was indentured into domestic service as a maid at a very young age. Looking at the six kids Annie Dalby was left to support, I suppose I can guess what happened. Grandma made it plain she thought my brother and I were soft and spoiled, and with the benefit of hindsight it’s hard to argue. I generally think of myself as a pretty ordinary person, lucky in life but not especially wealthy or privileged. Today I’m feeling very grateful to be standing on the shoulders of people like William and Annie. This entry was posted in Everything Else and tagged eight ladies writing, Jilly Wood. Bookmark the permalink. What a great remembrance, Jilly! My uncle Ted enlisted for the war effort directly out of high school. He served in Europe and was poisoned with mustard gas; my mom said that afterwards, he was never the same. It’s incredible and sad to look back now and think how people said that World War I would be the war to end all wars, when we have had so many since. That generation was a tough one. I, too, am happy that I had parents and grandparents who reflected those values of strength and sacrifice. I only wish that our president could demonstrate those values for today’s young folks! Thanks for sharing, Jilly. I don’t have any family history around WWI, but both of my parents enlisted out of high school for WWII – my father at sea and my mother in the states in one of the women’s auxiliary corps. Neither of them talked about that time afterwards, though it had to have changed them, just as living through the Great Depression had. I have been thinking about the Armistice, not just because of the date, but because of a book I just read that was set in that period in Britain. Although the main story was a mystery, it did a wonderful job showing the impact of the war on those in the trenches and those at home, as well as the challenges faced when trying to get back to “normal” life afterwards. You just made me realize that I have no idea if my grandfather served in WWI–and no one left to ask, unless my older sisters happen to know. 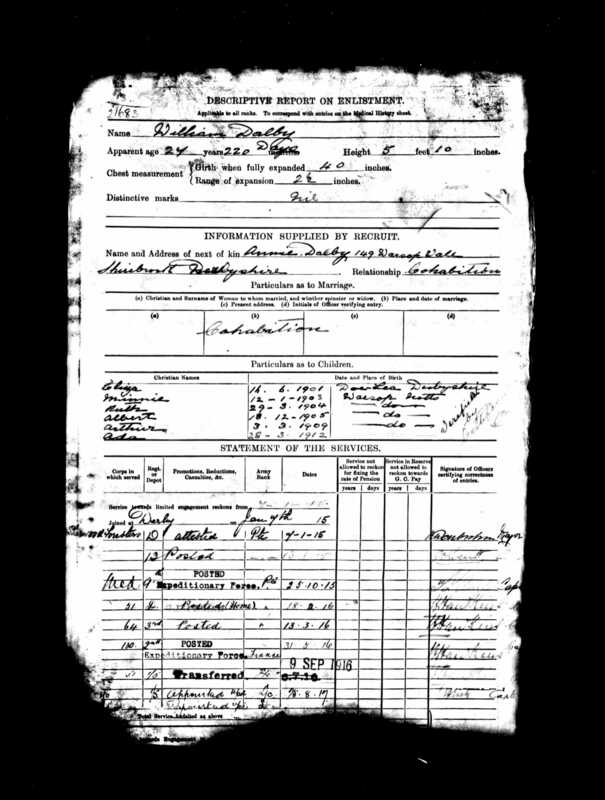 Jeanne, in Australia at least you can look up the military records of people if you have their full name and date of birth, although records more recent than WW1 may involve permission from their widow, if they are still alive. Also, some things (again, at least in Australia) are expunged – if they had VD, for example, that’s deleted. I worked for the National Archives of Australia on a digitalisation project; it was fascinating! There’s so much I’d like to know about my family, and typical that I’m curious now that there’s nobody left to ask. Exactly as Anne said, though, it’s amazing how much information is available online. I know my father’s father served in WW1 by lying about his age, though like Elizabeth’s parents he never talked about it afterwards. We know he was in France, and once he let slip that he’d had a horse, though how he came by it and what happened to it I have no idea. My mother’s parents were a few years too young, and I didn’t know anything about their parents until my mum died earlier this year and I had to do some research as part of the paperwork. That’s how I found William, Annie and their six kids. Family trees are something that run in my family (-:. We have our family historians, and some old pictures that one of the second-cousins-twice-removed is sharing through an email newsletter. A lot of my family left Europe because of the incessant wars — they wanted their sons to avoid conscription. So, I’m not sure, but I think most of my family escaped WWI because they were farmers (necessary for the nation). Even in WWII, one grandfather was a farmer, and the other went to Alaska to build runways. My dad had his Vietnam, though. There’s so much information on the internet. One great-aunt had typewritten a family history, so I know some little details about my grandmothers, as well. One ancestress bought a sewing machine, and was afraid her husband would hit the roof, but everything turned out OK. He came home and said, “If I’d known you wanted a sewing machine, I would have gotten you one.” Another ancestress was a bit . . . um, loose. There was a rumor that she told a guy she’d gotten pregnant, but he’d refused to marry her, so she wound up marrying my great-grandfather and had my grandfather. And it turned out that the guy who stood her up? Was the father of my grandmother! We’d all like to know a little more about that, but nobody is left to gossip. Although, never say never. My other grandmother was always mysterious about her wedding date. She said the courthouse burned down and took the records with it. But my cousin-the-genealogist was travelling in Missouri, and decided to stop by a courthouse just past the Nebraska border . . . and lo-and-behold, found the missing marriage license! April 1 marriage. My grandmother had passed by then, so it was nice to have the mystery solved.